With his biceps and righteousness pumped to the max, Chris Evans’s superhero Captain America is an enjoyable square peg in the round hole of the sleek Marvel universe. That continues in this involving sequel to 2011’s WWII-set Captain America: The First Avenger, placing the character in an unusually shady political landscape. We’re in present-day Washington, D.C., a faintly utopian place where glass buildings gleam and Steve Rogers (Evans) can befriend former army supersoldier Sam (Anthony Mackie) during a pleasant morning jog. But it’s also the site of a massive military build-up: three huge "helicarriers" are stored under the city’s river, ready to pry into people’s privacy a bit too impressively. Surveillance anxieties in a spandex-clad comic-book blockbuster? Just as you’re savoring the hint of an ethically compromised, eye-patched Nick Fury (Samuel L Jackson), along comes the film’s secret weapon: Robert Redford plays against lefty type as an ominous high-ranking official thrilled by his new toys. Too quickly to generate proper suspense (yet causing plenty of giddy disbelief), The Winter Soldier nods to ’70s classics Three Days of the Condor and The Parallax View. It results in a vertiginous, turned-over epic where U.S. senators whisper allegiance to terrorist organization Hydra and good guys are on the run. The Marvel faithful will turn up for the action scenes, and the directors, brothers Anthony and Joe Russo, add an uncommon sharpness to sequences of urban warfare—these Heat-grade bullet volleys have a real ping to them. But unlike the magically well-balanced The Avengers (2012), there’s a touch of character bloat here: The title actually alludes to a vicious steel-armed threat (Sebastian Stan) who never quite develops into a distinct opponent. 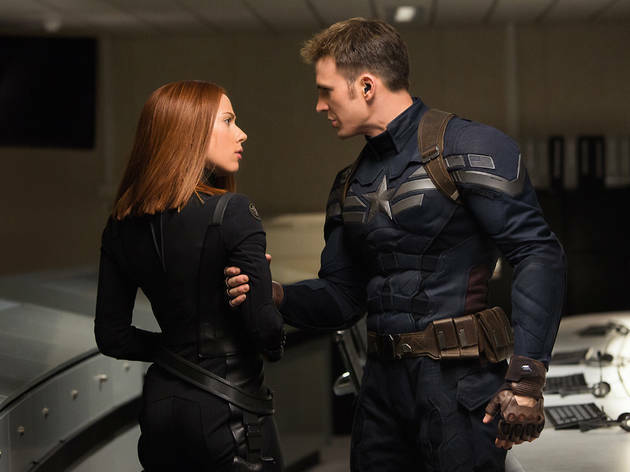 Scarlett Johansson doesn’t have a hard time commanding attention as Black Widow, though you’d think she would have earned a more complex role by now. Still, this instalment delivers a heavy and welcome dose of paranoia, administered between fleetly paced smackdowns.